I’m Hugh and I manage the GOV.UK Verify user support team. This post provides an insight into how we do user support. GOV.UK Verify is a platform for identity and represents a new way for citizens to prove who they are when they use government services. GOV.UK Verify is the first of its kind in the world and our users are playing a vital role in its development. As such, we need to have a user support team in place that’s equipped to collect and respond to the feedback received, and resolve issues promptly for users when they arise. I joined GOV.UK Verify in October 2014, just as the service went into public beta, and was solely responsible for the user support function for several months. One of the benefits of conducting service design in phases - alpha, beta, live - is that it lets you start small and get feedback faster before rolling a service out to a wider audience. With more services connecting to GOV.UK Verify and a steady increase in user numbers as a result, it soon became clear that recruiting a team to handle user support was a priority. We scaled the team up quickly and since May 2015, I’ve been joined by Vivienne, Hannah and Jacob. Together, on average, we respond to around 1000 contacts from users every month. Our aim is to provide first class support for everyone attempting to verify their identity using GOV.UK Verify. 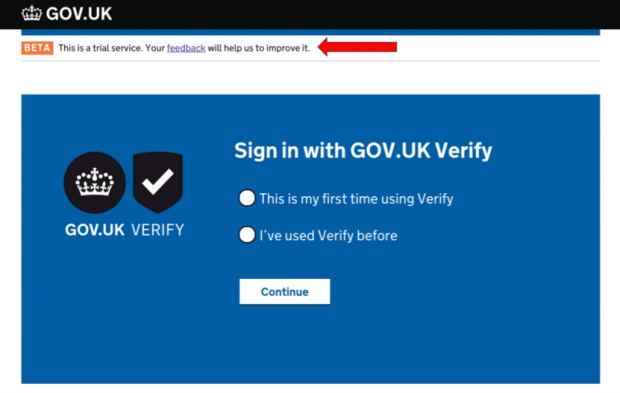 You can contact the user support team when using GOV.UK Verify by clicking on the link at the top of the page where it says that the service is in a trial phase and your feedback will help us to improve. The purpose of the form is to provide advice and guidance on the service when you are having an issue, receive comments/suggestions on the service for improvements and to hear how the service has been of benefit to you. The user support team are available Monday to Friday from 8.00am to 6.00pm and aim respond to any messages within a maximum of five working days. We are currently averaging a first response to users within 24 hours. The services using GOV.UK Verify have their own help and support systems and details of those can be found via their page on GOV.UK. Your feedback counts and does make a difference to the ongoing design and development of GOV.UK Verify. One recent example of this was when the user support team received a number of messages relating to certain buttons not working on the start pages of GOV.UK Verify. This was quickly passed to the technical team and the issue was identified quickly, investigated fully and the matter resolved within 24 hours. Have your say in this service, the user support team are your voice within GOV.UK Verify and we want to help. I tried to get through verification yesterday, and failed again. However, I used the feedback link and got a reply from Jacob within a few minutes which was excellent! Still trying to get verified though. Thanks for your comment - it's great to hear that the user support team responded quickly to your concerns. I’m sorry your chosen certified company could not verify you. GOV.UK Verify is in beta (trial), which means it is constantly being developed and improved based on feedback from people who use it. We’re not able to verify everyone yet using GOV.UK Verify and we do appreciate how frustrating that can be for those we are unable to verify at this stage. However, we’re working to constantly expand and improve the service. Verifying someone's identity without talking to them or sending things in the post is a complex process and it will take us some time to make it work for everyone. You may wish to try registering with a different certified company as they each use different methods to verify you. Additionally, whilst we are in the trial period and still developing GOV.UK Verify, there are always other ways to access services so if GOV.UK Verify doesn't work for you, please return to the service you were trying to access and use one of the other available ways to access it. Not sure if this has been answered elsewhere on your extensive blog, but I'm curious as to what happens to my Government Gateway ID (GGID) and all the data associated with it after GOV.UK Verify comes out of beta? Is my GGID data combined with Verify? Will my GGID account be fully deleted or will it languish somewhere on a server? Will I have the option to cancel and delete my GGID? I ask because I've been through this before (NHS HealthSpace for example) where a service is introduced, we register with it, and then it gets axed with little explanation as to how our registration data is handled afterwards. As a consequence, I'm tentative about registering with GOV.UK Verify. Hi Jay, thanks for your interest. When GOV.UK Verify moves from beta to live in April next year, it won't represent a dramatic change. Rather, it will be a point in time in an ongoing gradual process of developing and scaling up GOV.UK Verify, when the service can be said to meet certain criteria (https://identityassurance.blog.gov.uk/2015/10/21/gov-uk-verify-the-latest-on-progress-towards-objectives-for-live/). We're gradually rolling out GOV.UK Verify across an increasing range of central government services, but Government Gateway will remain for businesses and agents. Government Gateway provides an enrolment and authentication services whereas GOV.UK Verify is a totally new service that provides identity assurance for individuals entirely digitally, without having to rely on sending items in the post. The two services are separate and no user data from Government Gateway will be migrated to GOV.UK Verify. When you come to use a service that's connected GOV.UK Verify, you'll need to set up a verified identity account. Extremely worrying that to use the service you need to provide driving license or passport details. How exactly did these companies get this information unless you arranged for that to happen. When did DVLA or the Home Office announce they were doing this? Aren't they meant to state the purposes for which they are processing our data. This feels like introducing a national identity card by the back door. Thank-you for your comment, Derek. Certified companies use information from a wide range of different identity documents to verify you. These include photocard driving licences from Great Britain, UK and international passports, credit cards and debit cards. When you verify your identity using a driving licence or UK passport you provide the details from that document to the certified company. The certified company then submits this digitally, via something called the document checking service, which presents this information to the document issuer (HM Passport Office or DVLA) to check that the information you've provided matches a valid record. HM Passport Office and DVLA don't share any information other than a yes / no response telling the certified company whether data you've given matches a valid record. I am trying to verify myself for two days now, provide every data correctly and it still does not verify me and locks me out for 24 hours. I would say don`t lock people out only after the first try because I don`t have every single day providing my data correclty to try to get verified and then locked out again for 24 hours. I don`t know what to do and I have to register at HMRC to get paid. Someone please help. I'm sorry to hear you've been experiencing difficulties. Before I know where to direct you to help, can I please check if you were using HMRC's Government Gateway or if you were using GOV.UK Verify? GOV.UK Verify is a service which will enable you to complete digital transactions in a secure, fast and convenient manner. The service uses certified companies to verify your identity. GOV.UK Verify will replace Government Gateway for individuals across an increasing range of online services.